VRC by PFlow Industries Inc.
ACG Conveyors has partnered with PFlow Industries Inc. because, PFlow provides total engineering, fabrication and coast-to-coast installation service. PFlow is at the forefront in design and manufacture of safe and reliable, material handling lift equipment. They has installed over 16,000 Vertical Reciprocating Conveyors world wide and they are the market leader and innovator in the Vertical Lift Industry. 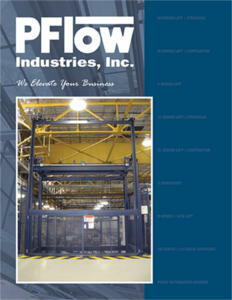 We are proud to be partnered with PFlow Industries and to offer their products to our valued customers. 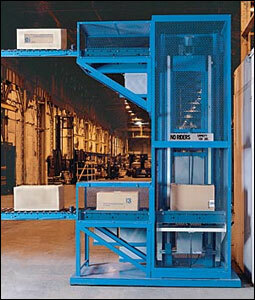 Vertical Reciprocating Lifts and Material Lift Elevators move products, supplies, material and equipment from one level to another. VRC’s are not elevators. VRC’s are exempt from national elevator codes and regulations. Fully Automated Vertical Conveyor Systems are custom designed to your exact needs; from simple to complex to sophisticated multi-level material handling, and multi-directional material and equipment handling systems. See Brochures and Manuals section below. Hydraulically lift equipment loads up to 6,000 lbs. Equipment Life expectancy of over 20 years. 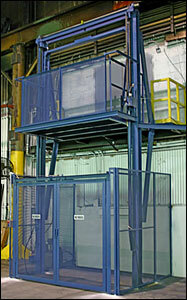 Versatile and dependable Mechanical Vertical Lifts for high-speed, multi-level applications for large or heavy loads.